Indigenous pelargoniums are mainstays of the garden, providing instant colour for window boxes, containers on patios or in flower borders. Pelargoniums, which are commonly (and incorrectly) referred to as geraniums, are sun loving perennials which require very little care, yet provide months of colourful flowers and foliage. The trailing ivy-leafed pelargoniums have fleshy leaves and are ideal for window boxes or containers on sunny patios. There are numerous hybrids available in various shades of white, lavender, pink and red. The ivy-leafed cultivars can also be allowed to scramble up fences or along sloping banks where their blooms make a good splash of colour amongst other climbers. The regal and zonal pelargoniums are small, upright shrubs. Regals have very exotic flowers that are often frilly, blotched or marked and leaves with serrated edges. Look out for the dwarf regals which are tiny replicas of the larger more robust cultivars. Zonals bear bright flowers and often have variegated leaves with horseshoe-shaped bands. The fancy leafed zonals have very attractive leaves with golden and copper-coloured veins. Although all pelargoniums are evergreen, the zonals provide the best leaf colour – even in winter when all other pelargoniums are not in flower. Succulent pelargoniums thrive in rockeries. Many of the succulent species have strongly fragrant aromatic foliage, distinctive trunks and succulent leaves. P. tetragonum has interesting geometric stems and ornamental cream flowers. The low maintenance P. laxum has a mass of thick greyish coloured stems, and forms a dense succulent shrub in rock gardens. 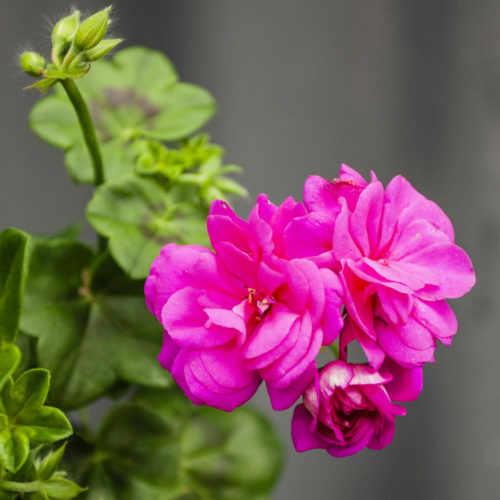 Scented-leafed pelargoniums have a shrubby habit, insignificant flowers and highly fragrant leaves which have a strong smell of coconut, peppermint, lemon, musk or nutmeg when crushed. Their leaves are used extensively in the perfume industry. Add these leaves to pot-pourri, to sauces and jellies to enhance the flavour or to fingerbowls at dinner parties. It is a good idea to plant these highly scented pelargoniums along pathways or in containers near the entertainment area, where their leaves can be brushed against and their glorious fragrance enjoyed. Scented leafed pelargoniums are amongst the most versatile and hardy of all the fragrant foliage plants, even tolerating light frost. Lemon-scented (P. citronellum and P. limonseum). Rose-scented (P. graveolens, P. radens and P. capitatum). Of the true geraniums, the most popular indigenous species grown in our gardens is the carpet geranium (Geranium incanum), with finely-divided leaves and magenta flowers. “Although this species comes from the winter rainfall area of the Western Cape, it is easily grown in regions that experience light frost. Given a sunny, well-drained position, such as in a rockery, G. incanum will form a carpet of attractive foliage and flowers. It will tolerate moderate frost and seeds freely,”says Joan. “Geranium sanguineum, from the northern hemisphere, forms low-growing clumps of deeply-lobed leaves. The plants spread slowly, making them suitable for growing in flower borders and in small rockeries. The typical flower colour is purple-magenta, but there are also white and pink forms,”she concludes. Pelargoniums are basically sun loving plants, but in very hot gardens, they will prefer a semi-shaded spot. They need well-drained soil – avoid over-watering which can cause the plant to rot and will encourage growth at the expense of flowers. They benefit from a layer of mulch spread across their roots. Pelargoniums will be killed by severe frost, but will withstand temperatures as low as 5 degrees Celsius. Sprinkle 60g (a handful) of potassium-rich fertiliser around each bush in September to encourage a good flush of flowers. In March, take cuttings to propagate new plants. Place a 10cm cutting in a small pot filled with river sand. Once new growth is noticed, transplant into a larger container or in the garden.